In other celebrity culture news, Art Daily fills us in on a couple of new visual art exhibitions from artists better known for baking other slices of the cultural pie. The superb actor Anthony Hopkins is showing a few of his paintings at London’s Gallery 27 through Saturday, then at The Dome in Edinburgh, March 2-6. And trumpeter Herb Albert has a show through May 25 at the Ace Gallery in Beverly Hills of big bronze totems, all in black, and up to 18 feet tall. He’s been doing these for 20 years. Maybe you link Alpert and art with that famous Whipped Cream album cover from 1965. Dessert is more commonly the subject of Wayne Thiebaud, the California artist, who has a new retrospective, Wayne Thiebaud: 70 Years of Painting, on view through July 4 at the San Jose Museum of Art. Best-known for his effervescent donuts and cakes and the like, he branches out to other edibles (and even non-edibles), too, such as this 1961 painting of watermelon slices. Alpert’s big bronzes are inspired by the great totems of the Tlingit and other nations who live along the north Pacific coast ranging from present-day Washington state to Alaska. Thiebaud’s retrospective caught my eye partly because of his connection to another California artist, Beth Van Hoesen, whose most complete collection of prints is in the Vivian and Gordon Gilkey Center for Graphic Arts at the Portland Art Museum. Thiebaud was one of a group of important California artists who for many years held weekly drawing sessions at the old San Francisco firehouse that was home and studio to Van Hoesen and her artist husband, Mark Adams. And I’ve lately been working on an essay about Van Hoesen’s art. I have a small personal interest in Sir Anthony’ art, too. I remember interviewing him back in 1978 or ’79, on the release of his none too fascinating movie Magic, and he was at a low point personally: exhausted, doubting himself, wondering whether it wasn’t time to chuck it all in and try something else. Of course, it was a lull, and the best was yet to come, even if “the best” included, as Hannibal Lecter, playing a fellow who dined on Chianti and human flesh. Including, I imagine, a rich dark red. Cheers! 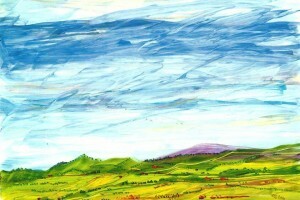 A landscape painting by actor Anthony Hopkins. 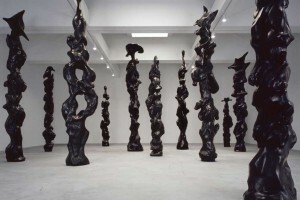 Herb Alpert, “Black Totems,” 2005-09. Courtesy Ace Gallery, Beverly Hills. 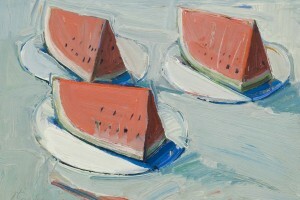 Wayne Thiebaud, “Watermelon Slices,” 1961. Oil on canvas. Private Collection. Copyright Wayne Thiebaud/Licensed by VAGA, New York, N.Y.